When Laura Kaye and her family set out for a July 4th holiday, she expected to see fireworks. But she had no idea that their summer vacation would begin with a bang that would change the course of her life. But over the next couple days, that headache would become crippling. So much so, that the Annapolis, Maryland mother of two ended up in the emergency room. What appeared to be a simple hit on the head was actually a traumatic brain injury. Laura’s doctor explained that when tissue is injured, the brain re-routes the neural connections around the injury, often activating parts of the brain that weren’t being used. That’s right. Eleven weeks. All those nights that Laura couldn’t sleep, she’d slip out of bed and into her home office and begin to do something she’d never done before. She wrote a paranormal romance novel. So, in a twist of fate that proves sometimes truth really can be stranger than fiction, Laura, who was a history professor at the Naval Academy, embarked on an entirely new career. She was so confident of her new skill, that she decided it was time to find an agent. So she sent queries to 60 of them. So Laura did what a writer does. She continued to write. She’d spend her days teaching and taking care of her family and every free moment at her keyboard. She surrounded herself with other writers, by joining the Romance Writers of America. And when she wasn’t revising that original manuscript, she’d write something called fan fiction -- on a site where fans craft stories about characters they’ve read about. When Laura couldn’t concentrate on her own protagonists, she’d write about Bella and Edward, the lead characters in the Twilight series. She wrote 28 chapters that got 3.8 million hits. Laura had built a fan base before she was ever published. What she couldn’t have known was that the audience she'd acquired would play an important part in what would become a bidding war over her work. In the meantime, she kept sending out revisions of her first novel “Forever Freed” and began working on new ones -- some based on the paranormal and others that were contemporary romances, with military heroes similar to those who had walked the hallowed halls of her workplace. And she began to explore other options. Digital publishing was heating up and e-publishers provided her with a whole new audience -- one that didn’t require an agent. Within weeks of her first query, Laura landed a deal. And it wouldn’t be long before she received a call that might leave even an established romance writer breathless. It was the beginning of a beautiful relationship. Laura sold the romance publisher a series called “Vampire Warrior Kings” and she continued to work on other ideas. In total, she sold 16 books completely on her own. Suddenly, Laura was back where she began -- looking for an agent -- only this time with lots of interest in her work. She signed with someone who had shown faith in her early on and then the storyline got even better. A bidding war began. And publishers had one week to make their best offers. By Wednesday of that week, Harper Collins made a pre-emptive offer -- an offer that was on the table for 24 hours, in an attempt to cut off further negotiations with others publishers. It was a four-book deal, only this time, in the high six figures. Just two weeks ago, Laura turned in the first book of that series. “Hard As It Gets” -- a romance novel revolving around a former military hero -- will be released on Nov. 26th, 2013. And now she’s taking a leave of absence from her job at the Naval Academy to write full-time. When Laura was recovering from her brain injury, her husband introduced her to the "Twilight" series -- and she couldn't get enough. 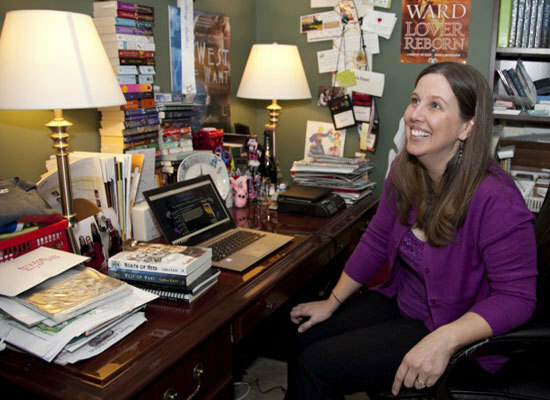 Overcome with a desire to write, Laura began slipping out of bed at night and going to her home office (pictured here) to write her own paranormal romance novel.